That's right! More answers. And, just think, we still have one more day after this one. I know you are all so excited to get to hear these answers. I’ve been very blessed with meeting so many wonderful people, friends even. This was something that came completely unexpected. See…I guess some of my crazy ideas do pay off. What do you hate about blogging? Who would play the MC if your ms was made into a movie? I mean look at these guys. Either one would work for me. Yummo! Thanks for giving me an excuse to post those pictures, Carol. No, I mean it. THANK YOU! What is your all-time favorite best experience of all time? I’m going to be sweet and sentimental right now, just don’t expect it to happen all the time (or ever again). If you could be any writer, who would it be? I’m resisting the urge to say Stephenie Meyer, because I mean, really, it’s kind of a given for me , right? So, if I couldn’t be Stephenie, I would definitely want to be Becca Fitzpatrick or Suzanne Collins. Those ladies are fabulous and I adore their work. What are your top 3 books of 2009? Hands down, my three top favorites for 2009 were: The Hunger Games, Catching Fire, and Hush,Hush, and Beautiful Creatures. I know that's four, but oh well. What part/scene of your book are you most looking forward to writing? I look forward to writing any and all kissing scenes. I’m trying, sneakily, to add more kissing time in. For example: why eat, sleep, or do anything for that matter when you could be kissing? Who's your favorite Twilight character and why? I had to think about this one. I think most of you know how much I love me some Twilight. And I absolutely love all of the characters. But, when I really thought about it, I would have to say Jasper just might be my all time favorite. I know, I know. You’re surprised aren’t you? You’re not the only one. And now, you’re probably wondering why I picked Jasper. Well, I was just about to tell you. You see, I, and probably every other woman on the face of the earth, can relate to Jasper. His craving for blood kind of reminds me of a woman on a diet. I know, if I was on a diet, Bella was made of chocolate, and she started oozing warm milk chocolate, I’d probably attack her too. See, we can relate. And, as if that alone isn’t enough, he can control your mood, girls. It doesn’t get any better than that! No more sad days. Just happy, happy, happy days from here on out. I love these questions posts! And for the record..I would love to know what color you painted your toenails...black like Lena? I would be highly entertained! 1 - Besides writing and reading what is your next favorite obsession/hobby? Anything? I don’t really have any hobbies, just obsessions. My biggest obsession is TV. I love TV. It makes me so happy. Especially when I see all the pretty boys that little box of magic holds. How could you not love that? The TV and I are a match made in heaven. 2 - If you could live anywhere in the world (money was not an issue)...where would it be? It would have to be a penthouse in Manhattan, on the beaches of Santa Monica, or near the Golden Gate bridge in San Francisco. See you back here tomorrow for the last day of answers. I love your answers, so funny! I must read HUSH, HUSH as I adore your other top three books. Oh this was great! I especially love the Jasper/diet question. I haven't read or seen Twilight, but I totally know what you mean! That makes it a great answer. I agree with Kristi, these question posts are great. Who got them started anyway? And do they have to be passed to you? I don't think anyone wants to know that much about me! But YOU are interesting and witty! Great nail polish and boy pics! Happy Tuesday! I am loving your answers, mixed with commentary!!! Keeps everything light and airy... it's fantastic!!! Great to get to know you. I love Jasper as well. He seems so tourtured it is cute. Not sure if you are still taking questions--What elements attract you to a blog? What keeps wanting to come back and read it? "I know, if I was on a diet, Bella was made of chocolate, and she started oozing warm milk chocolate, I’d probably attack her too. See, we can relate. " Ooh, I'm obsessed with TV too. Great pictures! Yay! My questions were answered! I love this game but poor you having to do all the work just for our entertainment. Thanks for the yummy pictures too...so pretty! And I have quite the tv obsession to by the way! Darn distractions! 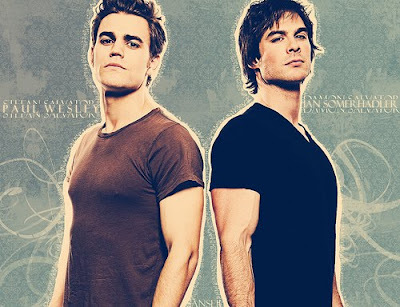 Stefan and Damon!!!!! I don't think I can go back to work and focus after that! I'm drooling so I should stop now :). Or not, it is Stefan, after all. I'm heading back to your post now to look at Stefan! This so fun, Kimberly! I love your "awww" answer about you and hubby. I'm really enjoying these posts. This series of posts is like blogging catnip for me!! Haven't done the Twilight thing (although I saw the first movie...and...meh), but I do watch Vampire Diaries. Alexa - Hush, Hush is a must read! I promise you'll love it! Christine - I love all of the Twilight characters! They're all so cute! Kristi - LOL! That's what I'm here for: entertainment. Eva - You should just wait til tomorrows post...YUMMY!!! DL - Catnip...LOL. I'll take it! Thanks for coming back. So fun! We love learning all about you. Keep it coming! Fabulous answers. Simply fab!! And you're very welcome for giving you a reason to post your boys. Total hotties, both of them. Perhaps you can have one play the first part of the movie, and the other play the second? Just sayin. And that nail polish color? Drool drool. Hot stuff!! Love getting to know more of you. And how cool that you answered my questions!! Yay! I'm special! This is awesome! I love your blog,great answers! And, you are so special. Thanks for being so sweet.